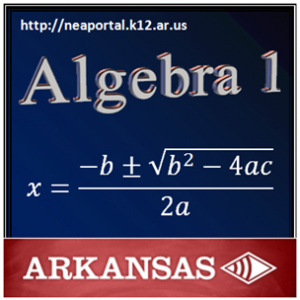 LA.1.A1.1 | LA.1.A1.1 (En Español) Evaluate algebraic expressions, including radicals, by applying the order of operations. LA.1.A1.2 | LA.1.A1.2 (En Español) Translate word phrases and sentences into expressions, equations, and inequalities, and vice versa. LA.1.A1.3 | LA.1.A1.3 (En Español) Apply the laws of (integral) exponents and roots. LA.1.A1.4 | LA.1.A1.4 (En Español) Solve problems involving scientific notation, including multiplication and division. LA.1.A1.5 | LA.1.A1.5 (En Español) Perform polynomial operations (addition, subtraction, multiplication) with and without manipulatives. LA.1.A1.6 | LA.1.A1.6 (En Español) Simplify algebraic fractions by factoring. LA.1.A1.7 | LA.1.A1.7 (En Español) Recognize when an expression is undefined. LA.1.A1.8 | LA.1.A1.8 (En Español) Simplify radical expressions. LA.1.A1.9 | LA.1.A1.9 (En Español) Add, subtract, and multiply simple radical expressions.